A long term relationship is something incredible. It feels like expanding our self into something more than just ourselves. Being in a long term relationship gives you a sense of calm; however, the long term relationship has to be healthy for all this. Alternatively, the other sides of a long term relationship can be nasty. The feeling that you are never alone is one of those; the lack of the joy in discovering something new is another one. Alas, being in a long term relationship can either be a blessing or a curse. The amazing message that I want to send today is that you are the one who decides the type you want. With a bit of effort, you can turn your long term relationship from a derailing train to something unique. Faby and I have been together for seventeen years. In these, we had our ups and we had our downs. Despite considering ourselves a very strong couple, we had our issues; because yes, every couple has issues. Living a long term relationship is not simple, and we must be ready to put our partner in front of our needs. At the end of the day this is more challenging than it may seem. Yet, the reality behind a long term relationship is that not every day is happy. Our goal as part of the couple should be to foster the couple’s happiness every day; however, this also means facing the difficult discussions. Today I will talk about the three things I value the most in keeping my long term relationship healthy and my family happy. Don’t take any of one as more importantly than the others. Each of the three points are pivotal to your and your partner’s happiness. All in all, good communication in a long term relationship is key. Even if we think our partner should understand what we are going through, nothing should replace sitting together and talking to each other. It is not just in the daily life, it is also in the difficult moments. Fostering a long term relationship is about trusting each other. After many years, communication tends to lower. This is mainly because the discovery phase goes away. There are very few things we don’t know about each other. We won’t have the “ah ha” moment as we had many times in our first years of being soulmates. Yet, communication is and remains the key to a healthy long term relationship. One thing that tends to change through time is the boundary with your partner. In a long term relationship, the tendency is to lower those boundaries drastically. While this is an incredibly good thing to do, it has to be managed carefully. As individuals, we tend to be nasty with ourselves; we treat ourselves as we would never treat someone else. Alas, when the boundaries are low, we tend to use the same internal dialog we use on ourselves with our partner. The respect we generally reserve him or her tends to change. A long term relationship is opened to lack of respect exactly for this reason. Keep in mind who the other person in. Make sure you treat him or her with respect. I know that when Faby is nervous I may point it out as I feel she is part of me; however, while generally accepted, this is not ok. I know it and I try my best not to do it because it is just pointing out the obvious, while pointing my finger on what she may feel a negative trait of herself. The reality is that keeping the right amount of respect, while keeping the chemistry, is a difficult balancing act. The main challenge to a long term relationship is that sense of familiarity that develops. Don’t get me wrong, the familiarity is a positive traits of a relationship, but it can also be detrimental to it. The key issue is that you start taking your partner for granted. In a long term relationship the risk is that, day after day, you stop being excited to have your partner at your side. Faby and I can finish each other sentences, but this can be a blessing or a curse. It is a blessing because the other person feel understood; however, it can also be a curse, as we don’t feel listened to. A healthy long term relationship is full of patience. Even if you know what your partner wants to say, let him or her say it. Don’t second guess every single things he or she does. Let him or her surprise you, even if it not a complete surprise. You do not necessarily need to know everything. A long term relationship is about two people sharing their lives for a long time; however, it is still about two people. Don’t try to be one with your partner, try to be yourself in a partnership. Do you want to truly surprise your partner? Come and be photographed by us, or gift her a boudoir experience. Go outside your comfort zone and you will put back something to keep the health in your long term relationship! PS: you can also download our guide: 11 relationship advice for better intimacy! 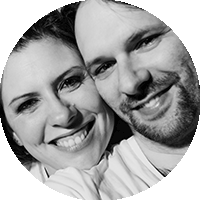 We are Faby and Carlo, Wife and Husband team specialising in photographing women. If you are reading this, apart from being very thorough and cool, you know you can do it! If you are considering a Boudoir Experience for yourself, let us tell you something more about it! If you are considering being photographed, the best option for you is to get in touch with us.